Patient X has had repetitive episodes of low back pain for years. Interestingly these episodes started after a severe ankle sprain 2 years ago. His ankle continues to bother him today causing him to walk in a very abnormal way. 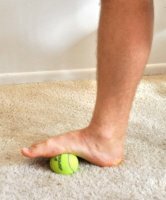 He turns his entire foot and hip outward in order to avoid the pain in his foot. Overtime this altered walking pattern places extra stress on his low back causing him to have repetitive low back pain. We’ve just had a few treatment, but my goal is to greatly improve the pain and movement of his foot allowing him to walk more normal!